The themes covered in this collection of essays span a wide area, from Christology and the doctrine of God to human rights and Christian spirituality, and they were written and delivered in a variety of contexts, from colleges to churches, on both sides of the Atlantic. Some have been published previously, while others are new. The papers speak from within the liberal tradition of theology, and were written from 2005-14, following on an earlier volume, Traces of Liberality. The author has added a biographical essay and a personal bibliography. 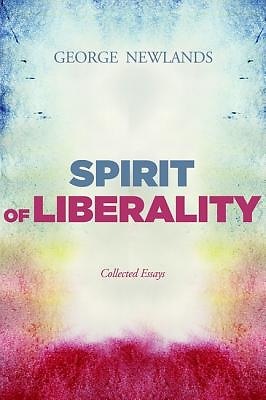 ""Liberal theology is not dead In this outstanding series of essays, as well as giving a liberal meaning to the word liberal, the author shows that liberal thought has been present in theology throughout the ages, and that it is to be celebrated, not feared."" --Keith Ward, former Canon, Christ Church, Oxford, UK ""These essays offer a series of developments of liberal theology in conversation with the classical Christian tradition. Set within the context of contemporary problems in the academy, church, and society, the collection shows how an unashamedly liberal approach may be pursued today in faithfulness to the cause of Jesus. Informed by Newlands's characteristic wit and wisdom, the volume will provide no small measure of enjoyment and illumination."" --David Fergusson, Professor of Divinity, New College, University of Edinburgh, Edinburgh, Scotland ""Liberality, inclusiveness, hospitality, generosity--the words that characterize the theology and writings of George Newlands. He carries his profound learning lightly and with a wit and grace that returns theology to the corners of human experience and embraces the wide world from China to Scotland and the broad highways of Los Angeles. Newlands sustains a liberal tradition in theological reflection that we cannot afford to forget or ignore."" --David Jasper, Professor of Literature and Theology, University of Glasgow, Glasgow, Scotland ""In Spirit and Liberality, George Newlands offers a series of essays and sermons charting the contours of a vibrant liberal theology. With characteristic passion and discernment, he engages a wide array of discourses and figures, thereby embodying in practice the inclusive, dialogical, and hospitable approach to the theological task for which his work calls, and challenging the reader to reconceive the contemporary shape of a faithful response to the gospel. Radical yet grounded, prophetic yet humble, and above all insightful--this collection comes highly recommended."" --Paul T. Nimmo, Professor in Systematic Theology, King's College, University of Aberdeen, Aberdeen, Scotland George Newlands is Professor Emeritus of Divinity in the University of Glasgow and an Honorary Fellow in the University of Edinburgh. A Fellow of Royal Society of Edinburgh, he is a former Dean of Trinity Hall, Cambridge. Recent publications include Christ and Human Rights (2006) and Hospitable God (2010).